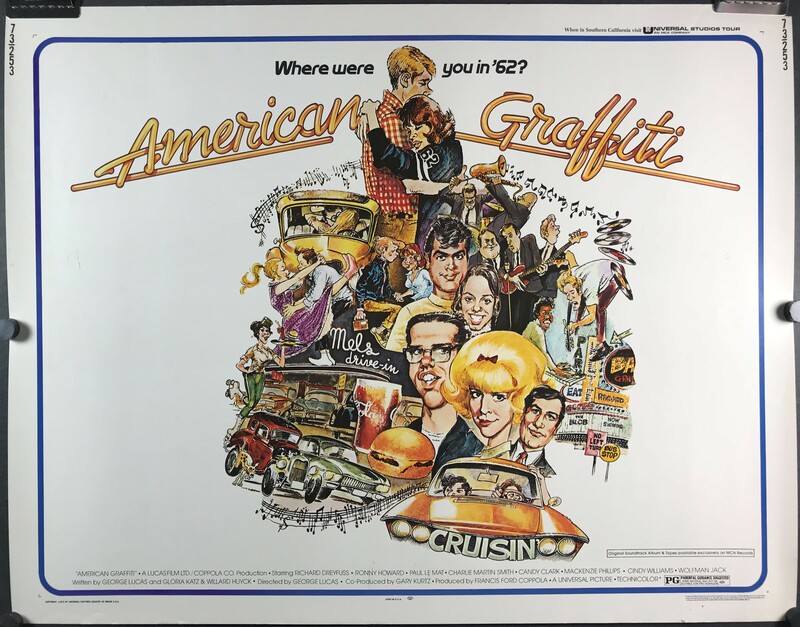 AMERICAN GRAFFITI, 1973. Original Half Sheet (22” x 28” / 72 x 92 cm) rolled movie poster starring Richard Dreyfuss, Ron Howard, Paul Le Mat, Harrison Ford and many more! Directed by George Lucas and produced by Francis Ford Coppola. “Where were you in ’62?” This classic comedy is based on a group of high school students spending one of their last nights in their hometown before they set off to college. A story many of us can relate to, the movie poster does an excellent job of capturing some of the best moments from the film. This poster is in excellent C9 condition with very bright colors and no damage or stains, although the top right corner is missing a small piece of paper. Linen Backing is available for this poster for an additional $60.